Comprehensive review of Rodan and Fields Foaming Sunless Tan. See what real experts and actual users have to say about this self tanning product. Price: $24.00 but they charge an extra $10 for shipping! I gave Rodan and Fields Foaming Sunless Tan 2.25 out of 5 stars. There wasn’t too much I liked about this product, but the color was at least natural looking for those of you who like a light tan. The thing I disliked most about this one is how long it took to dry. I read all these reviews online saying it dried quickly, so I was excited….but those reviews were SO wrong, it took over 45 minutes to dry and I felt really sticky. The scent was also very overwhelming. It smelled better than DHA, but the citrus perfume smell was so strong and a little “grandma” smelling. I wish the color it produced was darker. After one application I had a light tan, but it’d take a few more applications to get a medium to dark tan. The color was even and natural, which was nice. Oh and this is a white mousse so you don’t have to worry about a dark guide, but you do have to be extra careful when you apply to ensure you don’t miss anywhere. It made me mad that they charge $10 for shipping within the USA…I mean that’s just ridiculous. And they also make you sign up for a Rodan and Fields account before purchasing, which are both things that annoyed me. So overall, I wasn’t too impressed with the Rodan and Fields Foaming Sunless Tan. This mousse is a very bubble, airy, white formula. This is the only mousse I’ve tried so far that is white, not brown in color. So there’s no guide, which makes application not as messy. Compared to most mousses, it’s a little cleaner because it’s white in color. You don’t have to worry about a guide staining your clothing, sheets or towels. But you do have to be extra careful when applying this one to make sure you don’t miss any spots due to the lack of color guard. This one took foreverrrr to dry, and I felt so sticky while I waited. I’d say it took over 40 minutes to dry, and my legs kept sticking together when they touched…..worst feeling ever. Most mousses don’t feel that sticky, but this one was miserable. This mousse was also different in that on the bottle it says it only takes 2-4 hours to develop, most take longer than that. 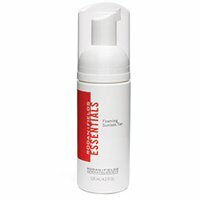 Rodan and Fields Foaming Sunless Tan has a very strong, sweet, citrus smell. I usually like citrus smells, but this one was too perfumey and overwhelming for my taste. At least I couldn’t smell any DHA. My skin still smelled a bit perfumey and sweet when I woke up, and I could smell a little DHA as well. The next morning, I had a light shade tan. It definitely wasn’t very dark at all, but at least the color was natural looking and not splotchy. I personally would apply this a few more days in a row to deepen my tan to a medium to dark shade. I’d say that’d take at least 3 applications total. So in my opinion, this one works more like a gradual self tanner. My light tan lasted around 3 days. After 3 days it faded rather quickly and unevenly and I became kind of blotchy in areas such as my legs and torso. Nah, there are better ones out there and this one takes forever to dry! I also don’t think men will like the strong, perfumey scent. Including shipping, this one is $8.10 per ounce. That’s definitely more than average, and it kind of made me mad that they charge $10 for shipping within the USA. To buy Rodan and Fields Foaming Sunless Tan, Click Here. Look and Feel This is a white, bubbly mousse. Application Applying it is not messy. But be careful where you apply! Smell (After) The next day I smelled DHA mixed with sweet citrus smell. Color Produced My tan was a natural looking, light shade. How Long It Lasts It lasts 3 days and then fades fast and looks blotchy. OK For Men? No, I really don’t think men will like this one much. Price It’s $8.10 per ounce with shipping, that’s higher than average.